Aside from crisps and nachos, no food should break when you drop it on the floor. 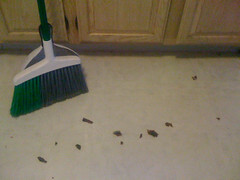 Burnt-to-a-crisp American bacon does, as exemplified by the picture. Delicious British oily bacon is resilient. Flexible. STRONG. When someone foolishly drops delicious, tasty, thick, slightly oily, British bacon to the floor, it stays yummy and edible!